Your oral health is threatened by tooth loss. Dental implants are a secure solution that eliminates the threat and provides you a natural looking tooth replacement. Your dental implant is crafted from a surgical grade of titanium. It’s placed via oral surgery into your jawbone. The implant creates a new tooth root that supports the post (abutment) and your new tooth (dental crown) on the surface of your gums. All implants are placed and restored by Dr. Van in our dental clinic. The start-to-finish approach helps assure that your implant procedure is functional and attractive. 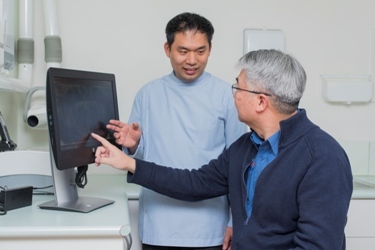 Dr. Van uses digital technology to accurately place your dental implant. The use of a cone beam CT and computer assisted surgical guide confirms the optimum placement of each implant. Your dental implant treatment requires a thorough oral examination and assessment of your overall health condition. Medical history, the condition of your teeth and gums, and your commitment to maintaining your oral health are essential to a successful procedure. Your dental implant restores your tooth function. You will able to eat, chew, and smile with greater confidence after tooth loss. Dental implants are designed to last for more than 10 years. It’s essential that you care for your dental implant as you would your natural teeth. Daily oral hygiene and routine check-ups plus professional teeth cleanings will keep your implant healthy. Contact VN Dental Clinic about your tooth loss or missing teeth condition. Schedule a consultation and oral examination to discuss secure tooth replacement with dental implants. Gum disease is the leading cause of adult tooth loss. At 54 years of age this woman lost a top tooth because of it but had her tooth fully restored with a dental implant and crown. Dental decay is destructive. 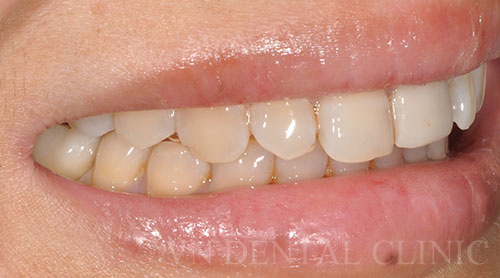 It can cause tooth loss and create a noticeable gap in your smile as it did for this 50 year old woman. 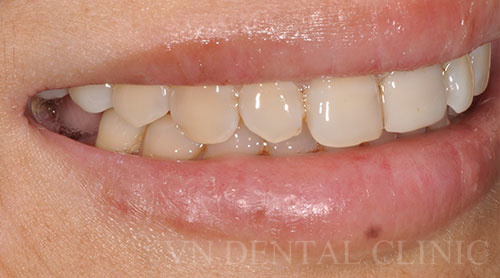 She experienced tooth restoration and closed the gap with a dental implant and crown.